In celebration of the home entertainment release of The Ultimate Legacy arriving on DVD and Digital HD on January 3 from Cinedigm, I am excited to host this giveaway with you. 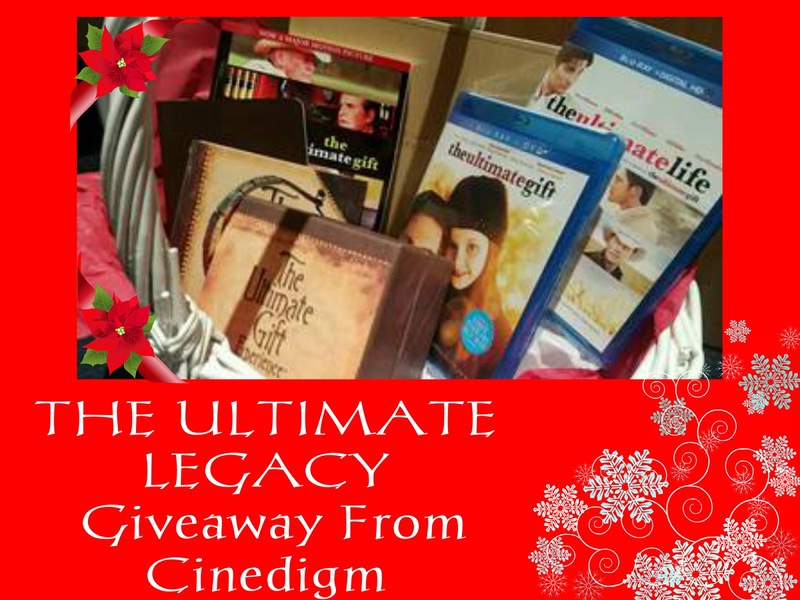 Cinedigm has offered the chance for one of my readers to receive The Ultimate Legacy gift basket! The Ultimate Legacy is the third film in the wildly successful “Ultimate Gift” book series following The Ultimate Gift and The Ultimate Life. The basket holds blu-ray copies of The Ultimate Gift and The Ultimate Life, an audiobook, The Ultimate Life novel, a special The Ultimate Gift experience capture deck and more! In the third installment, the film continues the journey of character Jason Stevens as he learns firsthand the value of teaching and finding purpose. Carrying a powerful message of hard work, generosity and family values, THE ULTIMATE LEGACY was hailed as “an inspiring film” by The Dove Foundation, and was awarded the “Family Approved” seal for children ages 12 and above. For Discussion Guide and more visit The Ultimate Gift Experience. I am most excited for the Blu-Ray.